I don't know about you, but before having Darcy I always said that my child would have a very limited time in front of the TV. Fast forward 4 years and I have to admit she spends more time that I wanted to watching TV. I don't actually think it's a bad thing as it gives me time to knuckle down on some coursework or answer emails without being interrupted. I always try to make sure, however, what she is watching is educational in some way and now we have a new show to watch that tick all our boxes. Ladies and Gentleman let me introduce The Hengelings”. Who are The Henglings you ask? 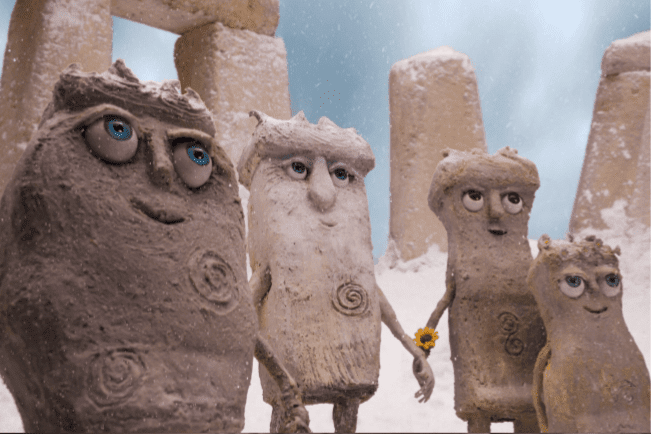 The Henglings are a family of motion puppets based on Stonehenge. It is a charming mix of fantasy, adventure and humour. Each show is set over the course of the day that starts at sunrise and ends at sunset and the family returning to their beds. There is a mother called Solstice, a father called Sarcen, a daughter called Lintel and a son called Mortice – these all being words associated with the famous site. They’re well meaning and playful creatures and each episode has an underlying message about caring for the environment. The Hengelings speak forming expressive sounds and not words, which unfolds visually. occasionally using a word or sound that your child may recognise, however they will not get lost in the story as they will be helped along by the use of a narrator called The Wise Old Stone and he resembles an Easter Island head. The targeted audience is age 1-7yrs, however, after watching the trailer for the show. I think it will be great for alI the family. The show is a refreshing change to other shows out there and I love the meaning behind it.